You're struggling with sinus problems and your doctor examined you and gave you a diagnosis of sinusitis, which you’ve learned is sinus lining inflammation. The doctor prescribes you medication after your symptoms weren't responding to over-the-counter medications. However, even the prescription medication isn't providing you with enough relief and you're still experiencing congestion all day and throughout the night to the point that you’re now suffering from chronic sinusitis. Acute sinusitis typically lasts no more than four weeks. Chronic sinusitis can last longer than a few weeks; sometimes for years. And, finding the cause of your sinusitis can be difficult, making it hard to treat properly. To determine what treatment will work best for your sinusitis, you first have to find out what's causing it. For instance, decongestants will likely not be that effective if it's allergies that's causing your sinusitis. Allergies or a cold may trigger sinusitis. Individuals with a weak immune system who are exposed to fungus may get it. In some chronic sinusitis cases, it could be due to things like a nasal polyp, a nasal passage structural problem, or another growth that hinder your sinuses from draining as they should. If your symptoms last for more than a few days, visit our ENT doctor. Our ear nose and throat specialist in Houston can perform a thorough exam and may even order some imaging testing, such as a CT scan, X-rays or an MRI, to help identify the cause of your sinusitis. In many cases, treatment for sinusitis is a combination of various therapies like self-care and medication. Decongestants: Decongestants work by lowering the amount of mucus you have in your sinuses. They can come in the form of pills or nasal sprays. Using decongestant nasal sprays for more than a few days, however, could actually make your congestion worse, so be sure to follow the label instructions carefully and don't use more than what's recommended. Antibiotics: If it’s a bacterial infection that's causing your sinusitis, your doctor will likely prescribe you antibiotics. Generally, you'll take the antibiotics for around 10 to 14 days for acute sinusitis, longer for chronic sinusitis. Antibiotics work only for bacterial infections, so if a virus is causing your sinusitis, they won't help. Rinses: You'll use a specially designed squeeze bottle that rinses your nasal passages out. A neti pot or saline canister are a couple of examples of nasal rinses. Oral or nasal corticosteroids: Your doctor might give you a prescription for inhaled steroids that will reduce the sinus membrane swelling. You might have to take oral steroids if you have a severe case of chronic sinusitis. In many cases, your doctor conducts an allergy test to help determine if the sinusitis is due to seasonal allergies or a non-seasonal allergy problem. Allergy testing should be done by a board-certified allergist, which we have on staff here at Houston ENT & Allergy Services. You probably don't like the idea of having to stay on prescription medications since these can often come with adverse side effects. In this case, balloon sinuplasty may be an ideal option for you. When allergy treatment and medications stop providing relief, balloon sinuplasty may be a better option than traditional sinus surgery. With traditional sinus surgery, the surgeon removes tissue and bone to make the sinus opening bigger to help clear blocked sinuses and restore proper sinus drainage. Also, recovery after a sinus surgery procedure can often involve scarring and pain. With a balloon sinuplasty procedure, the surgeon dilates some of your major nasal sinus openings or all of them so they can clear and drain them. The surgeon uses a flexible, small balloon catheter during the procedure for opening your blocked sinus passages and encouraging drainage of your built-up mucus you've likely been suffering with if you have chronic sinusitis. Once the surgeon inflates the balloon, it widens and restructures your sinus passage walls, providing you with nasal congestion relief. On average, the balloon sinuplasty procedure takes around an hour. Our Houston ENT & Allergy Services doctor will decide on which balloon will provide you with the best results. At this point, you're probably wondering what the balloon sinuplasty cost is. The cost of a balloon sinuplasty procedure varies for each patient and typically is based on what their insurance company covers. Usually, there's a negotiated contract already in place with the insurance company, which will be the deciding factor of the fees the patient will pay out-of-pocket. With Medicare, these costs will likely be in the same range. Most insurance companies provide coverage for this procedure. Balloon sinuplasty is increasingly becoming recognized by medical insurance companies — and your insurance company may fully cover it presently or in the future. 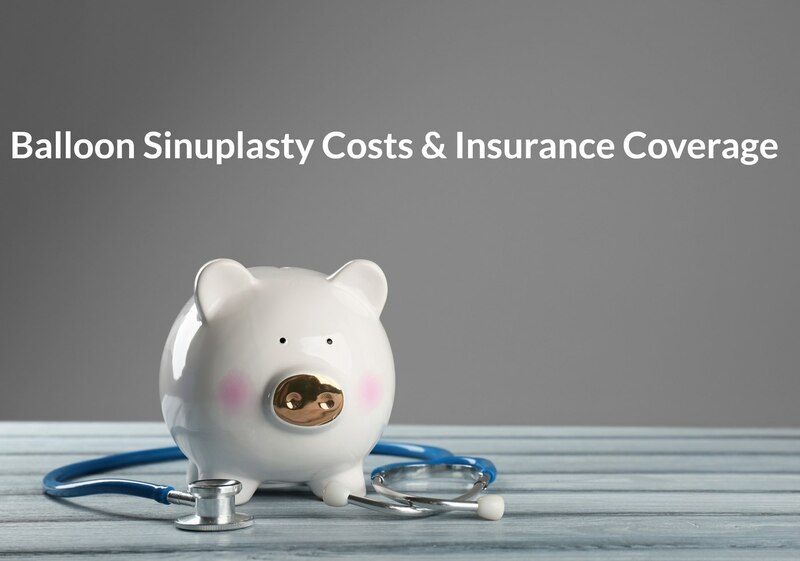 In fact, in 2014, the American Academy of Otolaryngology issued a statement calling for all medical insurance companies to consider providing coverage for the cost of the balloon sinuplasty procedure. There are still some providers, however, that continue to make it a challenge to qualify for balloon sinuplasty coverage. Several insurance companies feel as though this procedure is an elective procedure and therefore not eligible for coverage. Other insurance providers might require you to take a course of antibiotics for a certain number of weeks or even months before they'll cover you. They might also require you to undergo allergy testing. As mentioned, we have a board-certified allergist on staff here at Houston ENT & Allergy Services to provide you with allergy testing. If you're insurance provider is one that requires these additional steps, balloon sinuplasty and insurance coverage qualification may be delayed. To truly know if your insurance policy provides coverage for the procedure, call your insurance company and ask them. It is always recommended that you contact your insurance company to ensure you understand the complete details of your plan's benefits. If it's not covered, you can ask the doctor to submit a pre-authorization to start the balloon sinuplasty procedure. If the insurance company declines the pre-authorization, you and the doctor can submit an appeal asking to overturn the decision. If most of the costs of the procedure go towards your insurance deductible, you can usually have a payment plan set up, making it more affordable so you can begin the procedure sooner. If your policy won't cover the procedure or you don't have insurance at all, we have a cash price for Balloon Sinuplasty here at Houston ENT & Allergy Services. If you have been diagnosed with chronic sinusitis and are not finding relief or are not responding well to medications, you may be a candidate for Balloon Sinuplasty. Here at Houston ENT, our physicians can perform your Balloon Sinus Dilation procedure as an in-patient procedure in our offices. Contact Houston Ear Nose and Throat Clinic at 281-623-1312 today to discuss Balloon Sinuplasty and the benefits it offers for chronic sinusitis relief. Request an appointment with a Houston ENT Doctor to see if balloon sinuplasty is an option for you.